This album will relax you with the sounds of solo piano. 32 minutes (9 tracks) of soothing, sometimes jazzy and upbeat original pieces performed on acoustic piano. This song is simply reminiscent of the many times I’ve sat by a lake, river, stream, or other mirrored surface and reflected about my life, God, nature, family, and other important things in life. My intention for this track was that it remind the listener of a time when they have been hiking somewhere in the great outdoors. It has a bouncy, expectant, happy sort of feel and was inspired by all the hikes that I have been on. To me, there is nothing quite like a good hike in the woods with the sunshine, clean air, and incredible beauty of God’s world for us to feast our eyes on. Even at this late date in Earth’s history, with all the sin and corruption in this world, it STILL bears the gorgeous and awesome handiwork of the Master Designer. If the Earth is still this beautiful, what does God have in store for us in Heaven?!! For this track, I needed something a little more awesome and grand in sound. On many of the hikes my sons and I have gone on, we have encountered some sort of hill or mountain that needs to be climbed. It is interesting to note that since they are still young, they do quite a bit of complaining on the way up! But I’m always back behind them, giving them a boost up, or a word of encouragement, or sometimes both! Without fail, once we are at the top and can see for miles and miles, they are grateful for making the trip and usually begin to brag about how tough they are to have made it up the mountain. Isn’t that the way adults are too?! Isn’t this also an apt illustration of the Christian walk? How many of us complain and groan when hills and mountains appear in our life? Yet Jesus is there to encourage us and provide a hand up. We are usually always a better person because of it too! This track was inspired from the many times I have sat out on the back porch of my father’s cabin at dusk and pondered life and God’s greatness. There is a certain stillness and calmness that is like no other time of day. Usually you can hear the wind whispering and the river rushing in the distance. The birds and chipmunks are going to bed and reading their little ones stories (okay maybe not!). I can remember one time when my brother and I were on snowmobiles up at the old ski bowl and we turned off the sleds, leaned back, and beheld an incredible night sky filled with stars. At that moment, a shooting star swept across the night sky. I like to think that was God’s way of saying to us, “I’m here. I made all of this and I want you to get to know me.” To me, nature is God’s second Bible that has been written in pictures and sound, and scents, such that none of need doubt that there is a Creator. This track pretty much speaks for itself. These fish are SMART! All my life I have observed trout in their various habitat. I have noticed that they can spot a size 14 (and smaller) fly in whitewater which is amazing. I have also noticed that if there are other trout nearby and one of them gets hooked by my fly (usually in the lip), that they all swim near the hooked fish and follow him closely as though they are trying to figure out where he got the food, or perhaps how to help him, or perhaps, like humans, they are just busy bodies, I don’t know!! Since I practice catch and release fishing, in a moment the poor chap is free and quickly swims back to his chums to tell them all about it! I’m hoping that they don’t have many nerves in their mouth so I don’t have to feel too guilty about dragging them around the lake or stream. There are 2 rivers that join each other to form the Naches river below my father’s cabin. Before they join, and quite a ways up Chinook Pass, the rivers start out as streams. This track is intended to bring to the listeners mind the picture of a leaf being carried this way and that down the stream. Listen for a teensy little riff from “On Broadway” (by George Benson) in the solo sections. Couldn’t resist! I have seen many hawks and eagles in my forays into nature. There is nothing quite like the sight of these graceful birds soaring around the various hills and mountains. They instinctively know where to find lift (rising pockets of hot air) and it is a pleasure to observe them. Through the incredible patience and fortitude of my dear parents, I became an Eagle Scout at age 14. The Boy Scout program is an excellent way to foster the love and appreciation of the outdoors in young boys. I am thankful for the many parents who donated their time and efforts to our local troop. Every fall, at a certain time, we manage to head up to the cabin. We almost always take a short trip up the road to Bumping Lake. For some reason, every year for the last few years when we’ve been at the lake, there has been an unusually large frog population explosion. The frogs are all little tiny things and my boys (and soon, my girls too!) just love to build up little sand fortresses with moats for their thriving frog population. This track is a little ditty that reminds me of the constant blur of motion between me, my children, and the frogs. When we are through hiking, there is always the end of the trail, whether we arrive back at the car, or the porch, or a camping spot, there is a wonderful feeling of accomplishment and peace. We may have attacked the mountain and won (or not!). We may have been able to see Mt. Rainier on a sunny day in all her splendor. Whatever the case may be, we are thankful for our cabin and the great outdoors that it is nestled in. How will it be at the end of your life? Will you have the same satisfaction of a life well spent in service to God and your fellow mankind? Will Jesus say to you, “Well done, good and faithful servant; you were faithful over a few things, I will make you ruler over many things. Enter into the joy of your lord” (Matthew 25:21), or will He say, “Depart from Me, you cursed, into the everlasting fire prepared for the devil and his angels” (Mathew 25:41) . The choice is yours and mine to make before time runs out on this little planet. May we meet in Heaven some day is my prayer for us today! The songs on this album were primarily inspired by the times I’ve spent in the wonderful mountains in the Pacific Northwest near Mt. Rainier (on Chinook Pass). As you can no doubt guess, my father has a cabin there and I grew up spending weekends and holidays there. 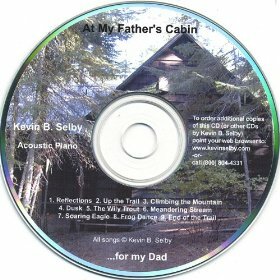 I am dedicating this album to my Dad because he was (and still is!) instrumental in fostering my love of the outdoors. Whether it was fishing outings at the various lakes and streams near the cabin, or later, Boy Scout hikes and campouts…my wonderful Dad was always there in a leadership position of some sort. He also ignited a passion for fly fishing that has never been quenched and I am now able to pass along that tradition to my two sons Jeff and Tom. Above all of these things, my father has also continued to be an outstanding source of encouragement, guidance, and counsel in all areas of my life, not just music! May these songs bless you and may you have as awesome a relationship with your father as I do with mine!